Alberto Giacometti, Unique Terse de femme, conceived 1932, cast 1948-1949. 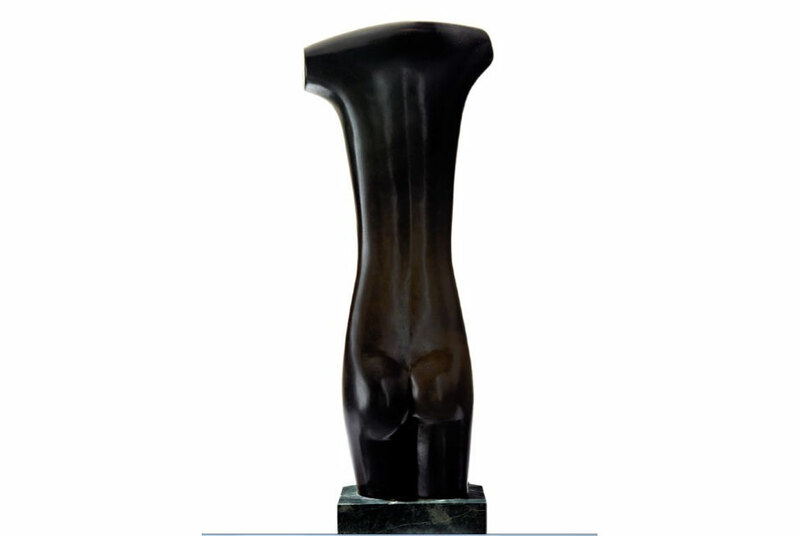 Dark brown patinated bronze, marble base. 28 x 81/16 x 6 in. Estimate: $2,000,000 · 3,000,000. NEW YORK, NY.- phillips de Pury & Company announces MOSS, an auction of art and design including works from the personal collection of Murray Moss and Franklin Getchell, founders of Moss, a beloved New York design institution. The auction, prefaced by a ten-day exhibition, will juxtapose contemporary and historical design with paintings, sculpture and photography. The assemblage was done in collaboration with ArtAssure, Ltd. The exhibition and auction will include important works by prominent contemporary designers including Maarten Baas, Hella Jongerius, Studio Job, Marcel Wanders, Fernando and Humberto Campana, Tokujin Yoshioka, Enzo Mari, and Alberto Meda, as well as master works by mid-century design master Gio Ponti and sculptor Leo Amino. Design icons will be paired in vignettes with sculpture and paintings by Frank Stella, Louise Nevelson, Alberto Giacometti, George Rickey, George Condo, and Candida Hofer, amongst others. As Wiesinger has stated: 'This female torso is closely related to three of the most important aspects of the art and working process of Alberto Giacometti: his willingness to address classical stereotypes of sculpture; his propensity to revisit and reprocess his past works; the pivotal role played between 1935 and 1949 by his muse, the English artist Isabel Delmer (Nicholas), in the definition of his mature art." Giacometti first met Isabel Nicholas after she moved from England to Paris in 1934. 'Tall, lithe, superbly proportioned, she moved with the agility of a feline predator,' wrote James l.ord.' Giacometti too moved with agility; he approached her one evening across the Cafe du Dome, haunt of artists, where he had observed her for many days. 'Est-ce qu'on peut parler?' he asked' The answer, of course, was yes. Muse to Giacometli for the next decade (and later to Francis Bacon), the young Nicholas first posed for Giacometti in his atelier, circa 1935. Those sittings resulted in Tete d'isabel (1936), a plaster head which bore striking similarities to the rounded profiles of archaic Egyptian statuary, specifically to a fragmentary bust of Queen Tiye in the collection of the Neues Museum, Berlin. During that same summer, according to Wiesinger, Giacometti began modifying an earlier work, Walking Woman I, 'deeply under the influence of his lover, Isabel. ..' This new standing figure, Walking Woman II, 'is a pivotal work in Giacornerti's production,' writes Wiesinger. 'It defines the sculptural prototype, developed by the artist from 1945 on in various degrees of vaclilating verticality, of an average-size woman ... and it evinces a sensuality that was absent in the works of the Surrealist period." In November 1949, Giacornetti stayed with Guggenheim in Venice at the Palazzo Venier dei Leoni in order to supervise Bianchi's casting of Torse de femme and of Walking Woman II, on which the former was based. Later that month, on November 25th, Guggenheim wrote to Giacometli: 'Dear Friend, thank you so much ...The bronze is not flnished yet. I will have it photographed for you and I will show it to You in Paris."